What is a Wayfinding Kiosk and Why Does Your Office Need One? As an image, the “You Are Here” dot on a map is so familiar, it’s arguably a pop culture icon. From shopping malls to hospitals to sprawling public-sector buildings, kiosks bearing this graphic—sometimes paired with a brightly-colored arrow—tell us precisely where we are and help us get where we’re going. Cultural icon or not, though, the “You Are Here” dot has limitations. Static map kiosks have never been great at handling fluid designs, particularly in growing workplaces. Layouts and office assignments change, floors assume too much space to comfortably fill a single map and renovations and construction projects alter existing footpaths. In our modern and connected world, the static map simply isn’t good enough—especially when a much better alternative is available. Enter the wayfinding kiosk, a cutting-edge response to the drawbacks of traditional maps. 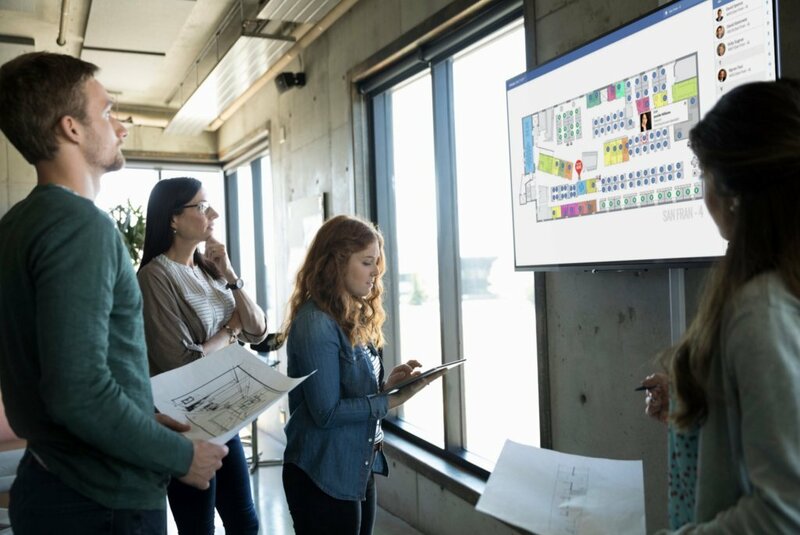 By rendering floor plans on an interactive screen—dedicated kiosk hardware is one approach, as are standalone iPads and wall-mounted touchscreens—businesses get a wayfinding tool that is every bit as fluid, responsive and change-ready as the office design it displays. 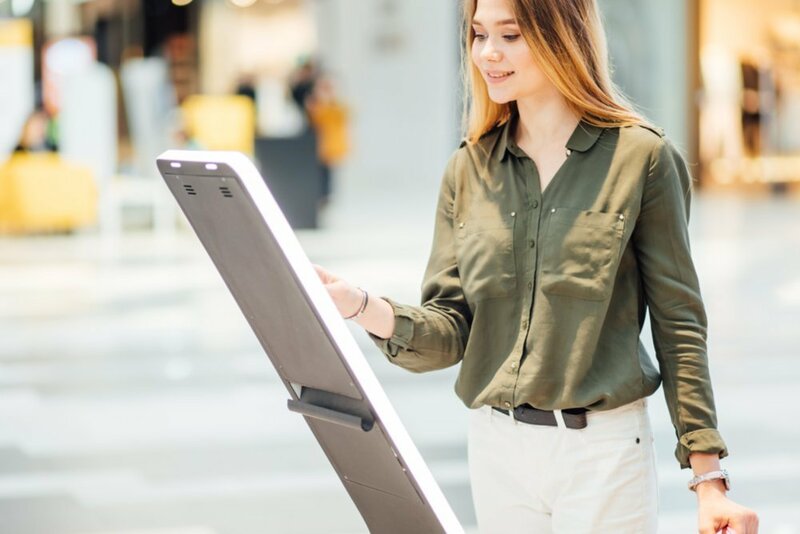 For larger offices and those that frequently change layouts, room functions and seating arrangements, a dedicated kiosk can mean the difference between frustrated employees (and guests) and empowered teams. To be sure, a wayfinding kiosk is a lot more than a digital image displayed on a screen. Basic map-displaying functionality is a core feature of tools like Visual Directory® for Kiosks, but it is also a foundational aspect for everything that comes next: the map’s digital format makes it a powerful tool for end users and facilities managers alike. For one thing, making your floor plans available on a screen—in real time—means that your processes are synchronized. Any updates a facility manager (FM) makes through Visual Directory software is reflected directly on the kiosk, allowing for immediate updates and wayfinding that is accurate down to the cubicle or chair. If your office employs hot desking or hoteling as a seating strategy, your employees can use a kiosk to find one other, even in a flex environment, and individual employee moves are shown as they happen. Add in boosted convenience for employees traveling to new parts of the building for the first time, and you’ve relieved your reception desk of some of the responsibility of directing traffic. A responsive kiosk takes real-time updates to the next level. By integrating with employee directories and other data sources, a digital touch screen can allow your visitors to find the specific workstations or offices they are looking for with the press of a finger. Depending on the size and complexity of your office space, you may choose to deploy wayfinding help on any number of devices. Since the data generated on the screen comes directly from floor plans generated in OfficeSpace’s Visual Directory, keeping it up-to-date is as easy as pushing an update. Consider the following tips as you figure out the best way to use your wayfinding kiosk. A directory is good for more than finding names. Employees should also be able to use it to get colleague contact information on-the-fly, for instance. And what if that new employee or visitor doesn’t need to find a person, but a resource? A conveniently-located kiosk is an excellent space to provide info on shared resources like printers, specialized workstations and empty meetings rooms. Setting up more than one type of wayfinding hardware can effectively help you turn each kiosk into a specialist station: a wall-mounted touchscreen in a lobby can be a general purpose directory, for example, while a podium-mounted tablet with stronger privacy protections can be utilized for viewing bookings or retrieving colleague contact info. Many FMs have come across employees who eschew an upgraded system or method in favor of the old way. With a combination of kiosk, mobile and desk-based support, it becomes easy to cut off this disinclination at the pass. If an employee touches base to see where a workstation or resource is located, walk them through how you answer their question within Visual Directory® for Kiosks. Over time, they’ll come to recognize the software as the useful office addition it is—and you may gain a new kiosk convert. For companies already using OfficeSpace software for facilities management tasks, upgrading wayfinding is as easy as figuring out which hardware you want to deploy, choosing a location and leveraging Visual Directory® for Kiosks to manage it all. For those still relying on older on-premises tools or pen-and-paper solutions, a software upgrade can revolutionize seating and space usage and keep visitors to your office successfully oriented. 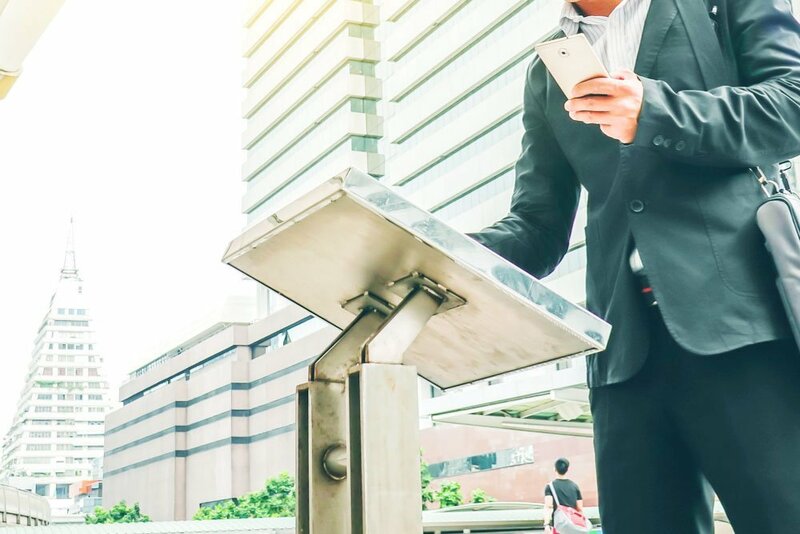 Either way, don’t rely on static media when a better alternative is available—like every other digital upgrade your office has undergone, you’ll soon be wondering how you ever got by without a digital kiosk to guide the way. Looking to set up an FM solution that enables effective wayfinding? Contact us for a free demo, and test out Visual Directory® for yourself.